The 28-year-old seminary student, who endured constant rain, hunger and competition losses in her week on the show, gave an interview to People.com about her experience, including a meltdown. You had a meltdown while out on the island. What was so hard about it? It was harder than anything I’ve experienced in my military training. I went six days without food, and with a scarce amount of water. It looks exciting on TV, but it’s really tough. I went into the game weighing 125 lbs., and left weighing 108 lbs. Wait a second. You lost 17 lbs. in a week? Yes, I did. I wasn’t eating or drinking. And just being out there can exert you. I thought about food every second. It gets to a point that’s almost scary, like you look at other people and think of them as food. Like they start looking like a roast chicken to you? Exactly! Like in a cartoon. I know! (Laughs) But when you’re really hungry – like really, really hungry – your mind plays tricks on you. And then add to it that you’re not sleeping and you’re exhausted. It makes it hard to focus on challenges and puzzles. Your tribe seemed close to solving the puzzle during the immunity challenge. We were so close. We could smell success, and we thought it would happen for us. But the challenge was brutal, and we came up short. It sucked worse than winning the first challenge. It’s demoralizing to lose two challenges in a row! You prayed a lot on the island. I pray all day long. Denise said that she doesn’t ask God for anything; well, I do. I ask God for everything. So I was asking God for strength. It was raining constantly; I thought the raindrops were going to drive me crazy. I was hungry and miserable. I needed strength. You targeted Angie for elimination. Why? 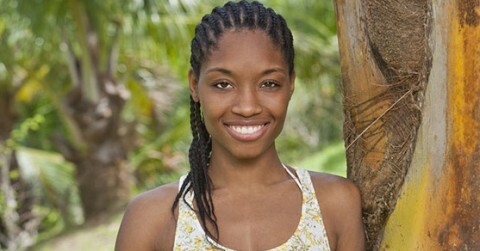 She was really close to Malcolm, and there were only five people in our tribe. A pair can become really powerful if you don’t break them up. I made good arguments for getting rid of Angie, and I thought maybe it would work. When she told Jeff [Probst] that all our tribe needed was cookies, I thought my tribe would vote her out. I was like, ‘Did you just say that? I can’t believe you just said that.’ Of all the things we needed, she’s going to say we need cookies. It was crazy! But the tribe decided to go a different direction and vote me out. But at least you got to eat something. I had cheeseburgers, pizza and French fries. I was craving carbs. I can’t even begin to tell you how delicious they were.